Queensland state police arrested 50-year-old My Ut Trinh for her role in the contamination of strawberries with pins and needles. 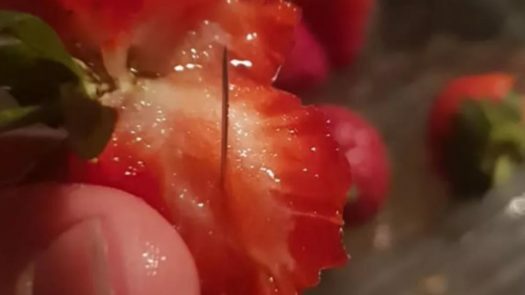 Trinh’s arrest comes two months after more than 100 cases of strawberries containing sewing needles and pins were reported across Australia and New Zealand. Reportedly, Trinh had been a former supervisor at the Berrylicious and Berry Obsession strawberry farm in Wamuran, Australia, one of the farms where the tampered berries were grown. It has been said that when Trinh put the needles into the berries, she was motivated by spite and had hoped to seek revenge on her ex-coworkers for mistreating her. Trinh was charged with seven counts of contamination of goods, and she faced the court on Monday. She was not granted bail, and her next court appearance is set for November 22. Even though Trinh was the main person behind the strawberry needle scare, the case against her only ties her to the contamination of six or seven punnets of strawberries. The Queensland Strawberry Association welcomed Trinh’s arrest but has called for those who helped or copied Trinh to also be charged.